This Luxe Linen launch party at Vibiana, in the historical core of downtown Los Angeles, showcased the fine linens Luxe has to offer, as well as the design prowess of some of the best event planners in L.A. including Charley King of Bluebell Events. Charley asked Embrace Life Photography capture the beauty of her amazing boho teepee and table design. The table is set with a gold brocade linen, edged with greens, a tall bohemian floral centerpiece, gold candelabra with white taper candles, colorful jars filled with flowers, votive candles, gold tableware, gold trimmed china and an assortment of goblets. 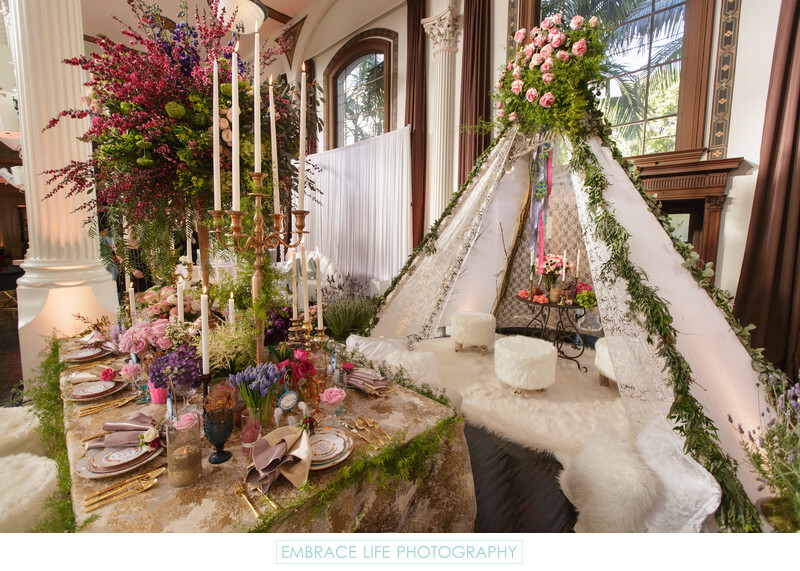 The large teepee lounge includes a fur rug and matching ottomans, a wrought iron table with bouquets of colorful flowers, taper and votive candles. The white lace trimmed tent has garlands of greenery running down from a large bouquet of blush garden roses and foliage.